Auto accident injuries cause many different symptoms, one of the most common being back pain. Whether you’re experiencing pain in your upper, mid, or lower back, pain and discomfort can interfere with your sleep patterns. Once you’ve suffered a back injury, it can be challenging to find a comfortable sleeping position. Additionally, people often have trouble falling or staying asleep after being involved in an auto collision due to other symptoms such as increased stress, anxiety, and not being able to relax. This is problematic because getting plenty of sleep during your injury recovery is essential to your health and wellness. As your trusted local chiropractor, we want to help you get deep and restful sleep to manage your pain during your recovery. Here are some bedtime habits to consider for sleeping better when you have back pain. For those people who have difficulty relaxing after a long day at the office, a hot bath can help. Run a hot bath and add some Epsom salt which can ease stress and anxiety, relieve muscle spasms and cramps, and soothe achy muscles and joints. Add a few drops of lavender, jasmine, peppermint, or rosemary essential oil to your bath. These aromatic scents have aromatherapy healing properties that can help ease your mind and soothe your aches and pains. Incorporating relaxation techniques into your nighttime routine can help you fall asleep quicker and stay asleep longer. Practicing deep breathing exercises before bed can ease stress and anxiety which are both common culprits for sleep disturbances. Taking slow, deep breaths while lying in bed calms your sympathetic system, which regulates your fight-or-flight response. Deep breathing activates your parasympathetic system allowing your body and mind to relax. Meditation is another relaxation exercise to practice before bed. A Harvard study suggests that “mindfulness meditation” is a beneficial practice which allows you to focus on your breathing and awareness while calming your mind so you can fall asleep and stay asleep. Meditation can not only ease stress and improve sleep, but it can also alleviate fatigue and depression. Finding the perfect pillow can be one heck of a challenge — they’re either too fluffy and flimsy, or too firm and stiff. Unfortunately, the only way to find a supportive pillow is to try them out until you’ve found the right one. You might shop for a pillow at a sleep store rather than a department store, as these retailers tend to have a better selection of pillows. If you’ve suffered a neck or back injury, you’ll want a firm pillow that adapts to numerous sleeping positions. You can always talk with your chiropractor to see what kind of pillow he recommends for your specific injury. Properly supporting your spinal posture is one of the best ways to achieve restful sleep. Sleeping on your back is the top doctor-recommended sleeping position. Place a pillow under your knees while you sleep to take the pressure off of your lower back. Sleeping on your side is the next best position. Place a pillow between your knees to support your spine and hips. 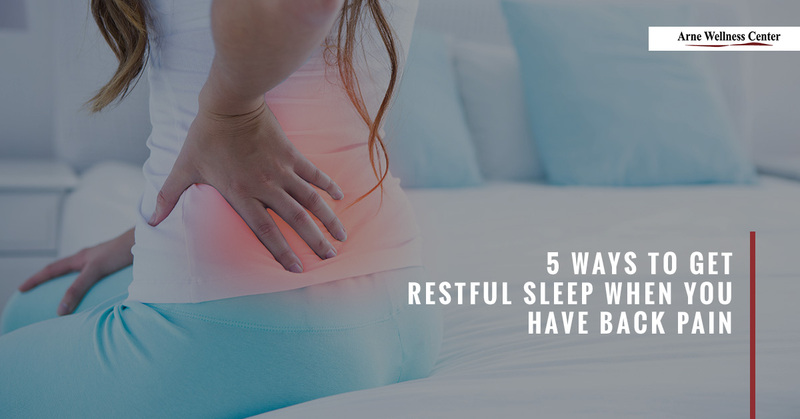 You might even use a pillow wedge to help support your entire spine while you sleep. If you’re a belly sleeper, this is a big no-no if you have an injured neck or back, as this position will likely increase your pain and discomfort. During your chiropractic treatment, talk with your chiropractor about your sleeping troubles. Chiropractic, acupuncture, and massage therapy are all effective treatments that can help with pain and stress management so you can get better sleep. To schedule an auto injury treatment in Littleton, call Arne Wellness Center today!